No matter how much food I've consumed, finding room for dessert isn't usually an issue. Back in January, as I prepared to run the 2013 Walt Disney World Half-Marathon, I was also on a parallel mission to utilize very entitlement I had on the Disney Dining Plan. Since desserts are near and dear, I've collected some new favorites to share. This dessert has been on my radar since Pop Century opened back in 2003. On this trip I was finally able to give it a try. Dense cookie crust on the bottom, creamy, colorful cheesecake on top, I was not disappointed. Food coloring is always risky as sometimes it can negatively affect the taste of whatever you're trying to color. Not here. The tie-Dye cheesecake was as smooth as you'd expect. LeFou's Brew and a maple cinnamon roll from Gaston's Tavern. Magic Kingdom's Fantasyland expansion brought the addition of two new dining establishments. To take on The Wizarding World of Harry Potter over at Islands of Adventure, Gaston's Tavern serves a frozen concoction called LeFou's Brew. Of course, I couldn't resist having it served in a souvenir stein! Unlike the extremely unfamiliar and sugary Butterbeer at WWoHP, LeFou's Brew reminded me of frozen apple juice. It was quite refreshing. Many people compare Butterbeer to LeFou's, but that comparison is hard for me to make. They were honestly too different; both were good in their own way. Maple cinnamon rolls round out the sweet selections at Gaston's Tavern. These cinnamon rolls are exactly the same as the ones served at the Main Street Bakery, except at Gaston's, they're topped with regular and maple icing. The maple icing didn't overpower the cinnamon roll and I'm not sure if you weren't aware that you'd even notice. Both of these desserts qualify as a snack credit on the Disney Dining Plan, however LeFou's Brew is served in a plastic cup rather than a stein when ordering from the Dining Plan options. 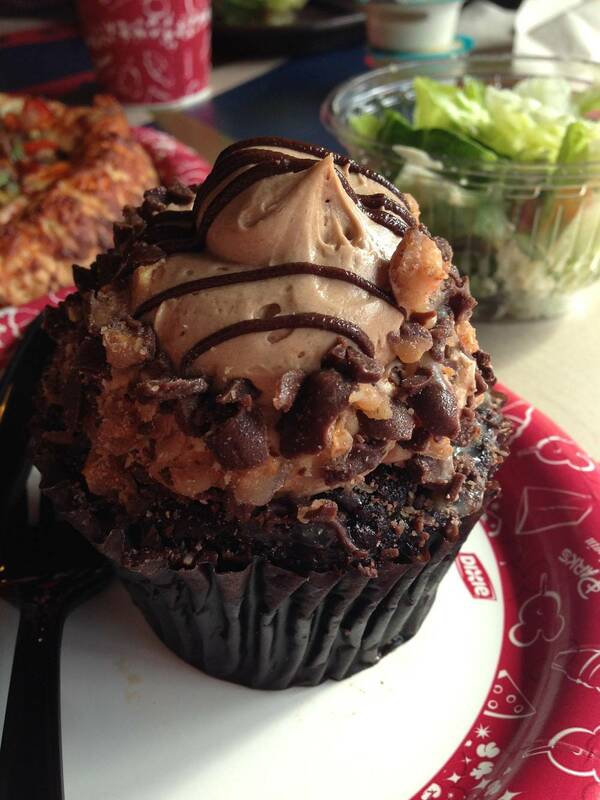 If it weren't for the Disney Dining Plan, I would probably never tried this cupcake. When dining at Toy Story Pizza Planet, you have three options for dessert. One is a Dannon yogurt cup, one is a chocolate chip cookie and one is a featured cupcake. I wouldn't dare waste a delectable dessert at Disney on a yogurt cup, but I understand why it's there. A chocolate chip cookie is so ho-hum. But a featured cupcake? Who could resist? Apparently my mom, who does not like the taste of coffee. Cappuccino Cupcake from Toy Story Pizza Planet at Disney's Hollywood Studios. The cappuccino cupcake is one of the most beautiful cupcakes on the Walt Disney World rotation. Often times, you'll find that Disney uses the same menu items at several locations that serve high volumes of customers. If you've visited Pizza Planet during lunchtime in the summer, you know that it's high traffic. Since eating at Pizza Planet, I have noticed this particular cupcake at several other locations. With a crunchy topping, thick buttercream icing and a cross section that would blow your mind, the cappuccino cupcake comes highly recommended by me. Each time I've ordered it, I have to slow my pace to keep from inhaling every bite. If you cut the cupcake in half, it's much easier to get a little bit of each component in every mouthful. Sometimes a particular attraction, resort or restaurant (I'm looking at you Le Cellier), gets so much hype it's difficult to take off the blinders and really evaluate the attraction for what it's worth. I've heard so much about the Out on the Boardwalk Trio that I knew it was going to be at the top of my list when I dined there. During my trip in January, we ate at Flying Fish Cafe on our first night. After a pretty lengthy meal that lasted nearly two-and-a-half hours, it came time to order dessert. Since we were on the Dining Plan, I proudly declared that we would like two of the Trios. To my surprise, our waitress opened her eyes wide and shook her head. "No?" I asked. I'm always thankful when you have a waitress or waiter who is honest enough to steer you away from a bad choice. "Pick two other desserts and I'll bring you a Trio," she said. To this day, I am still thankful for her honesty. We ended up scarfing down a peanut butter and jelly creme brulée and a triple chocolate mousse and the Trio sat largely untouched. After a nibble of the stale fondant cheeseburger, inedible pound cake fries and the too-sour limeade popsicle, we threw in the towel. There was one saving grace and it came in the form of a popcorn cheesecake. It was acceptable, but the portion too small to really stand out. If I were to eat there again, I would choose the triple chocolate mousse. Hands down. No matter how much I've eaten, I somehow always find room for dessert. January brought the opportunity to try some long sought after offerings and I was pleased to try them. 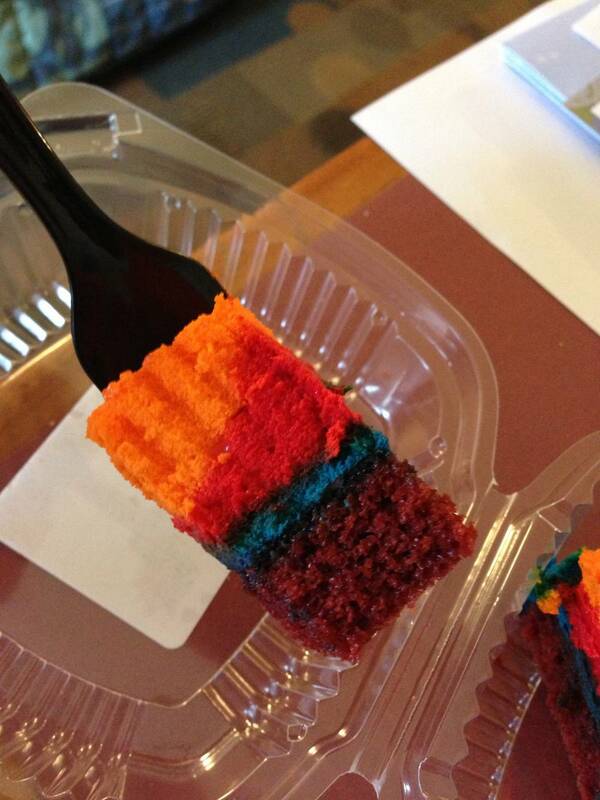 Some exceeded expectations, like the Tie-Dye cheesecake and some left me not buying the hype. I'll be back in May and I'm hunting for one thing...grapefruit cake from the Hollywood Brown Derby.